In Thai cooking, pork ribs are referred to as 'gradoog moo' or pork bones. We don't classify them as back ribs or spareribs. They are all just pork ribs. So, in the recipes, the choice is yours. 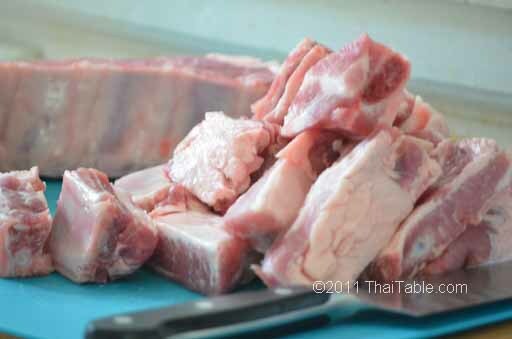 When pork ribs are called for in Thai recipe, the ribs are always cut into 1 1/2 - 2 inch pieces. At the US markets, they come in huge, long racks. Ask your butcher to cut them across the ribs twice to get the 2-inch width. You will get 3 long pieces. Then you will have to cut between the bones to get small individual pieces yourself.